JOSE A. (TONY) SANTOS, JR. represents clients in connection with agricultural acquisitions, restructurings and agricultural corporate and distribution issues and related transactions and agreements throughout the United States and elsewhere in the world. Mr. Santos also advises clients regarding information technology issues. A frequent lecturer and presenter on international law, Mr. Santos most recently served as moderator of a program presented in Paris, France on November 5, 2010 discussing US tax code changes applicable to multinationals, financial concerns and companies involved with multi-jurisdictional tax-driven structures (The American Assault on Tax Havens: An Update) with tax experts from the Unites States, Europe and the Organization for Economic Cooperation and Development (OECD). Most recently he was Vice President and General Counsel of JMsolutions, part of JM Family Enterprises, Inc., a $12.2 billion diversified automotive services company based in Deerfield Beach, Florida. JMsolutions developed software and software-based service offerings for the automotive industry in the United States and Canada. 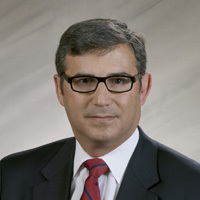 Prior to joining JM Family Enterprises, Mr. Santos was in private practice in Miami, Florida at Santos Stokes LLP (n/k/a Stokes Law Offices) handling corporate and commercial transactions for multinational concerns and financial institutions throughout the Americas in cross-border matters. In the past he has and has served Co-Chairman of the Steering Committee of the 1997, 2006 and 2009 Fall Meetings of the Section of International Law of the American Bar Association, as Chairman of the International Law Section of The Florida Bar, as Co-Chair of the Inter-American Law Committee of the American Bar Association’s Section of International Law and as Chair of the Greater Miami Chamber of Commerce’s International Services Export Initiatives, an innovative program designed to promote the export of US-based services around the world. In that capacity, he led international trade missions to a number of countries in the Americas and Europe. He also presently serves as a member of the Council of the Inter-American Bar Association based in Washington, DC. Mr. Santos has been recognized as one of the “101 Most Influential People in the International South Florida Business Community” and is listed in Who’s Who in International Business in Miami and South Florida. He has held numerous positions in community organizations in South Florida over the years. Mr. Santos is a 1984 graduate of the University of Miami School of Law, a 1981 graduate of the University of Miami’s School of Business Administration (with honors) and is admitted in Florida. Mr. Santos holds the highest peer review rating of AV assigned by Martindale-Hubbell. Mr. Santos maintains his practice in Miami, Florida and is of counsel to Stokes Law Office with offices in Miami and San Antonio, Texas. He is fluent in Spanish and conversant in Brazilian Portuguese.